India’s unique blend of cuisines evolved through large-scale cultural interactions with neighboring Persia, ancient Greece, Mongols and West Asia. New World foods such as chili peppers, tomatoes, potatoes and squash, introduced by Arab and Portuguese traders during the sixteenth century, and European cooking styles introduced during the colonial period added to the diversity of Indian cuisine. Indian cuisine has also influenced cuisines across the world, especially those of South East Asia. It is now one of the most popular cuisines across the globe,, enjoyed not only among the large Indian diaspora but also by the general population in North America, Europe, Australia and parts of Africa. 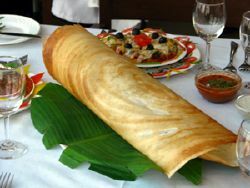 Masala dosa served in a restaurant in southern India. Indian cuisine is characterized by the widespread practice of vegetarianism across India's populace. 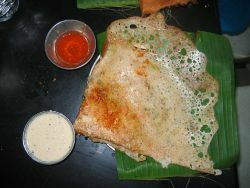 Ravva Dosa (fried batter) served at a Hotel in Guntur. The cuisine of India has is considered one of the world’s most diverse cuisines. Extensive immigration and intermingling of cultures through many millennia has introduced many dietary and cultural influences. India's diverse climate, ranging from deep tropical to alpine, has made a broad range of ingredients readily available to its many schools of cookery. In many cases, food has become a marker of religious and social identity, with various taboos and preferences (for instance, a segment of the Jain population consume no roots or subterranean vegetable; see Jain vegetarianism) that have driven certain groups to innovate extensively with the food sources that are deemed acceptable. 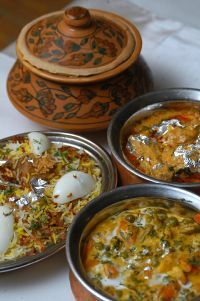 Hyderabadi biryani served with other Indian dishes. By around 7000 B.C.E., sesame, eggplant, and humped cattle had been domesticated in the Indus Valley. Many recipes first emerged during the initial Vedic period, when India was still heavily forested and agriculture was complemented with game hunting and products from the forest. In Vedic times, a normal diet consisted of fruit, vegetables, meat, grain, dairy products and honey. The ancient Hindu concept of ahimsa, a rule of conduct that prohibits the killing or injuring of living beings because violence entails negative karmic consequences, led some segments of the population to embrace vegetarianism. This practice gained more popularity following the advent of Buddhism in a cooperative climate where a variety of fruits, vegetables, and grains could easily be grown throughout the year. A food classification system that categorized every item as saatvic (pure), raajsic (active and passionate) or taamsic (heavy, dull, slow, gluttonous) developed in Ayurveda; each was deemed to have a powerful effect on the body and the mind. Later invasions from Central Asia, Arabia, the Mughal empire, and Persia, had a fundamental effect on Indian cooking. The Islamic conquest of medieval India introduced such fruits as apricots, melons, peaches, and plums, and rich gravies, pilafs and non-vegetarian fare such as kebabs, giving rise to Mughlai cuisine (Mughal in origin). The Mughals were great patrons of cooking; lavish dishes were prepared during the reigns of Jahangir and Shah Jahan. A blending of Mughlai and Telangana cuisines took place in the kitchens of the Nizams, historic rulers of Hyderabad state, resulting in the creation of Hyderabadi biryani, a traditional celebratory meal made using mutton or goat meat, basmati rice, yoghurt, onions, and spices, considered by many connoisseurs to be the finest of the main dishes in India. Influence from Arab and Portuguese traders resulted in diversified subcontinental tastes and meals. New-world vegetables such as tomato, chilies, squash, and potato, which were introduced during the sixteenth century, became staples of Indian cuisine. The British introduced European recipes and cooking techniques like baking. Most Indian curries are fried in vegetable oil. In North and West India, groundnut oil has traditionally been most popular for frying, while in Eastern India, mustard oil is more commonly used. In South India, coconut oil and sesame (gingelly) oil are common. In recent decades, sunflower oil and soybean oil have gained popularity all over India. Hydrogenated vegetable oil, known as Vanaspati ghee, is also a popular cooking medium that replaces Desi ghee (clarified butter). The most important and most frequently used spices in Indian cuisine are chilli pepper, black mustard seed (rai), cumin (jeera), turmeric (haldi, manjal), fenugreek (methi), asafoetida (hing, perungayam), ginger (adrak, inji), and garlic (lassan, poondu). Popular spice mixes are garam masala which is usually a powder of five or more dried spices, commonly comprised of cardamom, cinnamon and clove. Every region has its own blend of Garam Masala. Goda Masala is a popular spice mix in Maharashtra. Some leaves like tejpat (cassia leaf), coriander leaf, fenugreek leaf and mint leaf are commonly used. The use of curry leaves is typical of all South Indian cuisine. In sweet dishes, cardamom, nutmeg, saffron, and rose petal essence are used. The term "curry" is usually understood to mean "gravy" in India, rather than "spices." North Indian cooking features the use of the "tawa" (griddle) for baking flat breads like roti and paratha, and "tandoor" (a large and cylindrical coal-fired oven) for baking breads such as naan, and kulcha; main courses like tandoori chicken are also cooked in the "tandoor," a cylindrical shaped clay oven. Other breads like puri and bhatoora, which are deep fried in oil, are also common. 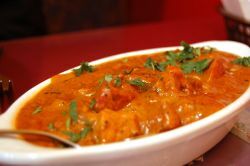 Goat and lamb meats are favored ingredients of many northern Indian recipes. The samosa is a popular North Indian snack, and now commonly found in other parts of India, Central Asia, North America, Africa and the Middle East. A common variety is filled with boiled, fried, or mashed potato. Other fillings include minced meat, cheese (paneer), mushroom (khumbi), and chick pea. The staple food of most of North India is a variety of lentils, vegetables, and roti (wheat based bread). The varieties used and the method of preparation can vary from place to place. 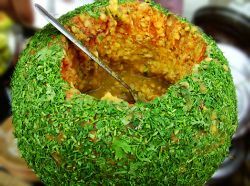 Popular snacks, side-dishes and drinks include mirchi bada, buknu, bhujiya, chaat, kachori, imarti, several types of pickles (known as achar), murabba, sharbat, aam panna and aam papad. Popular sweets are known as mithai (meetha means sweet in Hindi), such as gulab jamun, jalebi, peda, petha, rewdi, gajak, bal mithai, singori, kulfi, falooda, khaja, ras malai, gulkand, and several varieties of laddu, barfi and halwa. 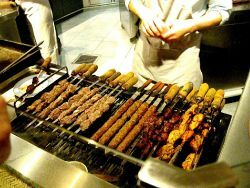 Some common North Indian foods such as the various kebabs and most of the meat dishes originated with Muslims’ incursions into the country. Pakistani cuisine and north Indian cuisine are very similar, reflecting their shared historic and cultural heritage. East Indian cuisine is famous for its desserts, especially sweets such as rasagolla, chumchum, sandesh, rasabali, chhena poda, chhena gaja, and kheeri. Many of the sweet dishes now popular in Northern India initially originated in the Bengal and Orissa regions. Apart from sweets, East India cuisine offers delights made of posta (poppy seeds). Traditional Bengali cuisine is not too spicy, and not too faint. 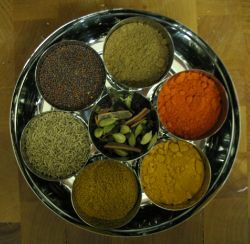 General ingredients used in Bengali curries are mustard seeds, cumin seeds, black cumin, green chillies and cumin paste. Mustard paste, curd, nuts, poppy seed paste and cashew paste are preferably cooked in mustard oil. Curries are classified into bata (paste), bhaja (fries), chochchoree (less spicy vaporized curries) and jhol (thin spicy curries). These are eaten with plain boiled rice or ghonto (spiced rice). A traditional Bengali breakfast includes pantabhat (biotically degenerated boiled rice), doi-chirey, and doodh-muree with fruits. 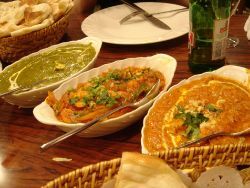 Bangladesh's cuisine is very similar to that of West Bengal, corresponding to the link between Pakistani and northern Indian cuisine. Fish is commonly consumed in the eastern part of India, most especially in Bengal. Rice is the staple grain in Eastern India, just as it is in South India. A regular meal consists of many side dishes made of vegetables. The popular vegetable dishes of Orissa are Dalma and Santula. 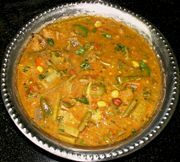 The most popular vegetable dish of Bengal is Sukto. Deep-fried, shallow-fried and mashed vegetables are also very popular. Fish is frequently featured in a regular meal. South Indian cuisine is distinguished by a greater emphasis on rice as the staple grain, the ubiquity of sambar (also called saaru, a vegetable stew based on a broth made with tamarind and toovar dal) and rasam (also called rasa, a soup prepared with tamarind juice or tomato, pepper and other spices), a variety of pickles, and the liberal use of coconut and particularly coconut oil and curry leaves. The dosa, poori, idli, vada, bonda and bajji are typical South Indian favorites and are generally consumed as breakfast. Hyderabadi biryani, a popular type of biryani, reflects the diversity of south Indian cuisine. Andhra, Chettinad, Tamil, Hyderabadi, Mangalorean, and Kerala cuisines each have distinct tastes and methods of cooking. Each of the South Indian states has a different way of preparing sambar; a connoisseur of South Indian food can easily tell the difference between sambar from Kerala, sambar from Tamil cuisine, Sambar from Karnataka and pappu chaaru in Andhra cuisine. Some popular dishes include the biryani, ghee, rice with meat curry, seafood (prawns, mussels, mackerel) and paper thin pathiris from Malabar area. 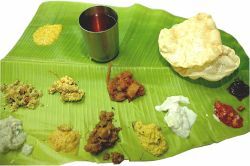 Tamil cuisine generally classifies food into six tastes: sweet (milk, butter, sweet cream, wheat, ghee (clarified butter), rice, honey); sour (limes and lemons, citrus fruits, yogurt, mango, tamarind); salty (salt or pickles); bitter (bitter gourd, greens of many kinds, turmeric, fenugreek); pungent (chili peppers, ginger, black pepper, clove, mustard) and astringent (beans, lentils, turmeric, vegetables like cauliflower and cabbage, cilantro). Traditional Tamil cuisine recommends that all of these six tastes be included in each main meal to provide complete nutrition, minimize cravings and balance the appetite and digestion. A typical meal, served on a banana leaf, includes steamed rice along with a variety of vegetable dishes like sambar, dry curry, rasam and kootu. Meals are often accompanied by crisp appalams. After a final round of rice and curds or buttermilk, or both, a meal is concluded with a small banana and a few betel leaves and nuts. Ragada made with yellow peas or lentils in a pani puri, (fried bread), a popular snack from Mumbai. Western India has three major food groups: Gujarati, Maharashtrian and Goan. There are two main types of Maharashtrian cuisine, defined by geographical circumstances. The coastal regions, geographically similar to Goa, consume more rice, coconut, and fish. In the hilly regions of the Western Ghats and Deccan plateau, groundnut is used in place of coconut and the staples are jowar (sorghum) and bajra (millet) as staples. Saraswat cuisine forms an important part of coastal Konkani Indian cuisine. Gujarati cuisine is predominantly vegetarian. Many Gujarati dishes have a hint of sweetness due to use of sugar or brown sugar. The typical Gujarati meal consists of Rotli (a flat bread made from wheat flour), daal or kadhi, rice, and sabzi/shaak (a dish made up of different combinations of vegetables and spices, which may be stir fried, spicy or sweet). Staples include homemade pickles, Khichdi (rice and lentil or rice and mung bean daal), and chhaas (buttermilk). Main dishes are based on steamed vegetables and daals that are added to a vaghaar, which is a mixture of spices sterilized in hot oil that varies depending on the main ingredient. Salt, sugar, lemon, lime, and tomato are used frequently to prevent dehydration in an area where temperatures reach 50C (120F) in the shade. The food of the North East is very different from that of other parts of India. North Eastern cuisine is strongly influenced by neighboring Burma and the People's Republic of China, and makes less use of well-known Indian spices. Yak is a popular meat in this region of India. Tea is a staple beverage throughout India; the finest varieties are grown in Darjeeling and Assam. It is generally prepared as masala chai, by boiling the tea leaves in a mixture of water, spices such as cardamom, cloves, cinnamon, and ginger, and large quantities of milk to create a thick, sweet, milky concoction. Different varieties and flavors of tea are prepared all over the country. Another popular beverage, coffee, is largely served in South India. One of the finest varieties of Coffea arabica is grown around Mysore, Karnataka, and is marketed under the trade name "Mysore Nuggets." 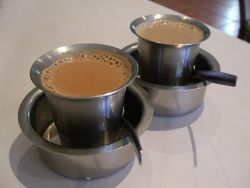 Indian filter coffee, or kaapi, is especially popular in South India. Other beverages include nimbu pani (lemonade), lassi (made by blending yogurt with water, salt, pepper, ice and spices until frothy), chaach, badam doodh (milk with nuts and cardamom), sharbat (juice prepared from fruits or flower petals) and coconut water. India also has many indigenous alcoholic beverages, including palm wine, fenny, bhang and Indian beer. The practice of drinking a beverage with a meal, or wine and food matching, is not traditional or common in India. People prefer to consume drinking water with their food, and it is customary to offer drinking water to guests before serving hot or cold drinks. Several customs are associated with the manner of food consumption in India. Traditionally, meals are eaten while seated either on the floor or on very low stools or cushions. Food is most often eaten without cutlery, using instead the fingers of the right hand (not the left since that hand is used for cleaning oneself after a bowel movement). Indian culture dictates that eating with your hands is a pleasurable experience, activating a so-called sixth sense, rather than using cutlery. Furthermore, the food is already in bite-size pieces making the use of a knife and fork unnecessary. Traditionally, the fingers are also used to feel the temperature of the food to one's taste, and combine flavors such as by tearing a small portion of bread (Roti, Naan) folding it into a small pocket to scoop a desired amount of food. However, these traditional ways of dining have been altered under the influence of eating styles from other parts of the world. Traditional serving styles vary from region to region in India. A universal presentation is the thali, a large plate with samplings of different regional dishes accompanied by raita, breads such as naan, puri, or roti, and rice. In South India, a cleaned banana leaf is often used as a hygienic and visually interesting alternative to plates. An Indian meal in a restaurant is generally called thali and is usually served on a round tray made of either silver, stainless steel or brass, with a selection of different dishes in small bowls. According to the region in which the restaurant specializes, a choice of native vegetarian or non-vegetarian delicacies is offered; one may encounter South Indian (vegetarian) thali, Chettinad thali, Mumbai thali, Rajasthani thali or Gujarati thali. Rice, even in a modest amount, is an essential component of thali. A North Indian thali consists mainly of Indian bread such as chapati, roti, paratha, phulka or naan along with rice, while South Indian thalis are served mostly with rice. In North Indian cuisine pooris and chappatis are offered first and the waiter serves the rice later, often in a separate bowl. The rest of the items, such as different curries, sweet and other miscellaneous items (applams, papad, pickles and beeda) are similar for both North Indian and South Indian thalis. Some restaurants offer 'unlimited' thalis, with "bottomless" refills on all components of a thali, so that the customer eats until fully satisfied. In some places the term means unlimited helpings of everything in the plate excepting a few items like the dessert or vada. Finally a banana, beeda, and a glass of juice or lassi will be offered. Indian cuisine is one of the most popular cuisines across the globe. 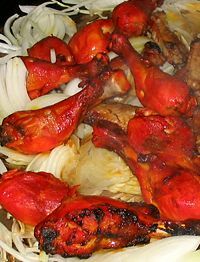 The cuisine is enjoyed not only among the large Indian diaspora but also by the general population in North America, Europe, Australia and parts of Africa. A survey held in 2007 revealed that more than 1200 Indian food products have been introduced in the United States since 2000. According to Britain's Food Standards Agency, Indian food industry in the United Kingdom is worth £3.2 billion, accounts for two-thirds of all eating out and serves about 2.5 million British customers every week. 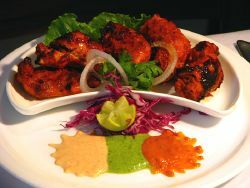 Indian cuisine is popular in South East Asia because of its strong historical influence on the region's local cuisines. The influence of Indian cuisine on Malaysian cooking styles dates to the nineteenth century. Spread of vegetarianism in other parts of Asia is often credited to ancient Indian Buddhist practices. Indian cuisine is also enjoyed in the Arab world because of its similarity to and influence on Arab cuisine. Mchuzi (curry) is a common dish in East Africa, where it was introduced by Indian immigrants during the colonial period. Indian immigrants also introduced their cuisine to South Africa during the nineteenth century. Curry's international appeal has also been compared to that of pizza. Historically, Indian spices and herbs were one of the most sought after trade commodities. The spice trade between India and Europe led to the rise and dominance of Arab traders to such an extent that European explorers, such as Vasco da Gama and Christopher Columbus, set out to find new trade routes with India, launching the Age of Discovery. ↑ 1.0 1.1 Evi Mariani, Indian food now attracts wider market The Jakarta Post, March 16, 2005. Retrieved May 30, 2017. ↑ Saritha Rai, An Indian Food Company Expands The New York Times, November 27, 2002. Retrieved May 30, 2017. ↑ FAO.org Growth and Concentration in India Retrieved May 30, 2017. ↑ Jared M. Diamond, Guns, germs, and steel: the fates of human societies. (New York: W.W. Norton & Co., 1997, ISBN 0393038912), 100. ↑ Prakashanand Saraswati, The True History and the Religion of India: A Concise Encyclopedia of Authentic Hinduism. (Motilal Banarsidass Publ., 2001, ISBN 8120817893) Google Books Retrieved May 30, 2017. ↑ Vinay Lal, Vegetarianism in India MANAS. Retrieved May 30, 2017. ↑ Spice India Online, Hyderabadi Biryani Retrieved May 30, 2017. ↑ Advice for Eating in an 'Indian' Restaurant in Britain H2G2, November 7, 2006. Retrieved May 30, 2017. ↑ Candie Yoder, Masala Chai Culinary Teas. Retrieved May 30, 2017. ↑ Saritha Rai, An Indian Food Company Expands New York Times, November 27, 2002. Retrieved May 30, 2017. ↑ Monica Bhide, Tikka in No Time The Washington Post, January 24, 2007. Retrieved May 30, 2017. ↑ Curry factfile UK Food Standards Agency, November 27, 2003. Retrieved May 30, 2017. ↑ Vegvoyages.com Indian Food Retrieved May 30, 2017. ↑ Ann Kondo Corum, Ethnic Foods of Hawaii books.google. Retrieved May 30, 2017. ↑ The Congo Cookbook Mchuzi wa Biringani (Eggplant Curry) Retrieved May 30, 2017. ↑ William Grimes, How Curry, Stirred in India, Became a World Conqueror The New York Times, February 1, 2006. Retrieved May 30, 2017. Collingham, E. M. Curry: a tale of cooks and conquerors. Oxford: Oxford University Press, 2006. ISBN 0195172418. Diamond, Jared M. Guns, germs, and steel: the fates of human societies. New York: W.W. Norton & Co., 1998. ISBN 0393038912. Indian Cuisine. Windstorm Creative, 2005. ISBN 978-1590921074. Saraswati, Prakashanand. The True History and the Religion of India: A Concise Encyclopedia of Authentic Hinduism. Retrieved May 30, 2017. Delhi: Motilal Banarsidass Publ., 2001. ISBN 8120817893. Yamuna Devi. The art of Indian vegetarian cooking: Lord Krishna's cuisine. New York, NY: Bala Books, 1987. ISBN 0896470202. This page was last modified on 1 August 2017, at 15:28.